We are no longer breeding skinny pigs - thank you!! Hello and a very warm welcome to Bailee's Beauties. 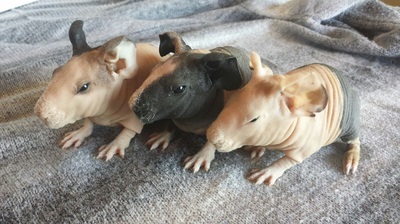 I am a small hobby breeder of Skinny pigs and skinny pig gene carriers, located in Granite City, Illinois. 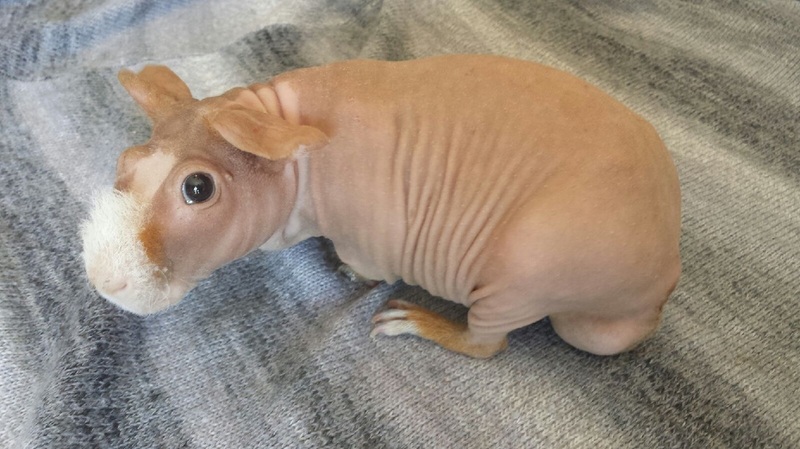 Say you don't know what a skinny pig is? 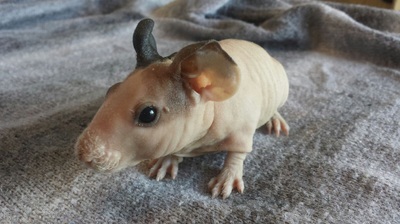 Well, a skinny pig is a breed of guinea pigs that is almost completely hairless except for some fuzz on the nose, and feet. If you decide to browse my webpage you will be able to find additional information such as the history of the skinny pig, current up to date tips on care for skinny pigs, any available pigs I may have, my intended partnerships with planned breedings, & much, much, more . If you have questions or would like to purchase a skinny pig or gene carrier please feel free to contact me. Both Mira and Wilbur are red & white skinnies. We are very lucky to have both of these pigs! We are very happy to call Wilbur and Mira our piggies of the month! 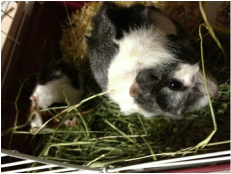 Mira and Wilbur are our two piggies of the month! Mira was purchased from Celebrity Skinnies in Texas and flown to St. Louis. Wilbur is the son of one of our previously sold babies and the owners could not continue caring for him so he has become a favorite here. Both of them are super friendly and have great personalities! My guinea pigs are very important to me and considered members of our family. I provide them with unlimited pellets, clean water, timothy hay, and fresh fruits and vegetables daily. My pigs have access to wonderful veterinarian care through our local Animal Care Center if required. I feel it is important to provide my pigs with daily exercise, frequent cage cleanings, and ample play time. I give them plenty of toys, treats, and fresh food to help keep my pigs healthy and happy. I typically spend at least an hour or more daily providing this level of care for my pigs. I ensure that each and every one of my pigs go to loving homes where they will be treated as members of the family. 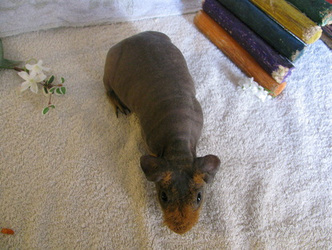 My goal here at Bailee's Beauties is to produce a beautiful line of skinny pigs. I breed for large bodies, color, health and personalities. I choose to keep a very small herd, and I only bring piggies who will benefit my breeding program in one way. Whether it be that this pig has a short nose and lovely personality or a beautiful body with goregous coloring, each pig brings in a valued trait. Personable skinnies are wonderful as they are filled with joy and love to be handles. Large bodied healthy skinnies are rarely sick and live long, full lives. 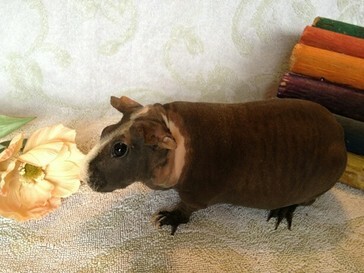 Beautiful colors make skinny pigs even more adorable! I hope to produce many skinnies fitting that description. In the beginning I had decided that I wanted to get a pet for myself. I went looking with my grandmother and came across the most beautiful abysinnian guinea pig. I immediately knew she was meant for me. I brought her home and named her Kirby. She was the best pet I could have ever hoped to have. As the days went by I decided that I thought she should have a roommate, someone to keep her company while I was at school, so I went out again and that is when I found Keira, a beautiful cream and white crested guinea pig. She made a wonderful roommate to Kirby and they got along so well. One day while out getting supplies and food I came across an American shorthair who gave me one look and I knew she needed to be part of our family. My "three musketeers" as I called them were the highlight of my day. At that point I knew I was hooked on guinea pigs and life was never going to be the same. Things were going great but unfortunately Kirby got ill and even with great veterinarian care we were unable to save her. Her loss was great, and we all missed her dearly (her information can be seen on our memorial page - a tribute to her). After a while I decided to start a search for another Abysinnian guinea pig. 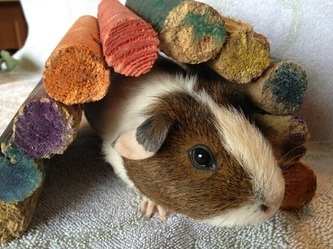 I began browsing the internet looking for a guinea pig for sale or for a rescue when I came across a breeder located in Cape Giradaeu, Mo. After looking at her website I discovered the skinny pig. I had no clue what a skinny pig even was, but they were so interesting looking. As I looked at her "Planned Breedings" page to my suprise I discovered that she had a lovely abbysinian sow, who was very pregnant and expecting gene carriers. I was so thrilled and excited beyond belief!!!! So I immediately emailed her to be place on the waiting list. A few days later after we received notification she had had her babies. Unfortunately though, all her babies turned out to be shorthairs. I decided not to take one because I had my heart set on an Abysinian. I continued my search and was blessed to find our beautiful Abysinnian, Kallie. She was perfect for our family, however I still remained curious about these skinny pigs. So a few weeks later I returned to look at the website. She had just had a few skinnies and a couple gene carriers born. I immediately fell in love with one of her skinnies so we contacted her to reserve him. A few weeks later we were able to pick up our "Gremlin" and bring him home. I love my Gremlin so much, and with that fell in love with the irresistible charm of the skinny breed. Wanting to share this joy with others I decided to get some more. I began spending countless hours researching their history, reading books, and identifying pertinent information. It was then I decided to start breeding these pigs as a hobby. My first planned breeding was my wonderful Gremlin to my lovely abbysinian sow Kallie. This is how Bailee's Beauties was created & I plan on continuing to create beautiful, cuddly guinea pigs and skinny pigs for many years to come.